Welcome to our family’s condominium at Emerald Towers, a locale we have enjoyed for over 25 years. Our comfortable, well-appointed, 1800 sq.ft., 7th floor end unit with two walls of wrap-around windows offers a fantastic view of the Emerald coast from the living room, dining room, master bedroom, and balcony. Once you exit the building, you need only walk a mere 30 yards past the pool and down the boardwalk to arrive on the beach. You might be interested to know that we just completed a total renovation of Unit 701. We have enlarged the master bathroom, moved some walls, installed new kitchen and bathroom cabinets, new floor tile throughout, fresh paint and colors, new kitchen appliances, and new furniture in all areas. The project took 4 months and was finished February 19, 2013. We are excited about the changes and believe it will be more comfortable for our family and for our guests like you. We have decorated our vacation home with comfort and convenience in mind. Our family likes to cook in, so the kitchen is well supplied with pans, bowls, and utensils to make meal preparation easy. We also have installed new stainless steel kitchen appliances including a nearly silent dishwasher. A dedicated icemaker will keep your beach cooler supplied with cold ice all day. In the living room, we have built a high-quality media center with a 46” LCD TV, surround sound speakers, and Blu-ray player. The master bedroom also has a new LCD TV. Emerald Towers Resort is a low-density high-rise condominium complex with just 84 units to share all the amenities. Two full service elevators provide rapid transit between the beach and our unit. The swimming pool’s deck area offers lounge chairs, tables, and umbrellas to enjoy when you are away from the beach. Two new grills have been installed for all guests to use. The exercise room, which overlooks the pool and the beach, is equipped with treadmills, stationary bikes, elliptical machine, and weights. There are also two lighted tennis courts on the property for your use. Emerald Towers prides itself on being a family friendly environment. It is the community policy not to rent to anyone under the age of 25. We have onsite security to protect our peaceful environment through the night hours. We are certain that you will enjoy a relaxing vacation if you choose to visit. - Fully equipped kitchen, dishes, cooking utensils, etc. - Boats, RV’s and trailers require prior permission for parking. Space may only be available in the Emerald Towers overflow parking lot during busy seasons. - Fitness center, with view of pool and beach, is equipped with treadmills, stationary bikes, an elliptical machine, and weights. - Onsite availability to rent jet skis, other water sport equipment, parasailing, etc. •	Relax by the pool or on the beach. You can rent umbrellas and chairs from a private beach service on the beach. For over 25 years our family has been going to Emerald Towers for our summer vacations. We have always rented and dealt with the uncertainties of different condos. So when we had an opportunity to purchase Unit 701, we were thrilled. We could make it just the way we wanted it for ourselves and our guests. Emerald towers is a one building, 84 unit complex that prides itself on being family centered. We love the staff there. Ann, Alice, and Deborah at the front desk and Larry and all the maintenance crew work very hard to take excellent care of Emerald Towers and everyone who is visiting there. The pool, the walkways, and the grounds are always very neat and clean and held to the highest standard. Having the pool right outside the back door of the building and the beach less than 30 yards from there makes going to and from the beach extremely convenient. We feel very safe for our entire family, even our children when they were children. There is a security gate to get to the property from the street and a security gate to get from the beach to the pool area. Also there is an onsite security guard during the evening hours. Good for peace of mind. Thirty yards from the back entrance of the building to the beach. Easy walking distance. Fully Equipped with dishes, pots and pans, cooking utensils, etc. In the office there are free movies you can check out. Spacious balcony with table and four chairs for dining or just enjoying the view. Pool Deck with tables and lounge chairs for sunbathing and picnicking by the pool. The newly resurfaced tennis courts are lighted and conveniently located onsite. Many first class golf courses are located nearby. Very nice property. Very well laid out. Thank you Jennifer for taking the time to post a review of your experience with us. Future guests finds those comments very helpful when deciding where to rent. I hope your stay was pleasant and comfortable, and that you will choose to stay with us again. 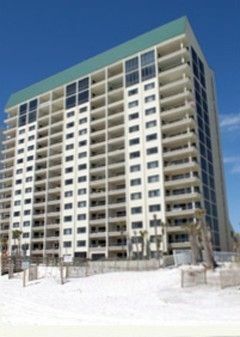 Great owners, great condo, great winter getaway !!! Emerald Towers unit 701 is the new benchmark for my family. We enjoyed every minute of this well furnished condo. The pictures and words do not do justice for it. We hope to be able to visit again. Thanks for sharing. This was our tenth summer vacation in Destin. We have stayed in several condos over the years, but this was by far the best one! Recently updated, beautifully decorated and well maintained! We like to eat in most meals while we are in Destin, so it was a huge relief to find that the kitchen had everything we needed to prepare and serve meals! Also, there was plenty of seating for our family in the living area when we wanted to relax and watch a movie together in the evenings. This condo provides the perfect combination of vacation and the comforts of home! Highly recommend it! This family’s condo is one of the best I have ever stayed in. The owner has given abundant attention to every detail. Their housekeeper does a superb job of cleaning the entire place to include the bathrooms, kitchen and floor. It is very spacious and comfortable, and the view of the gulf is phenomenal from the living room, the dining room, and the master bedroom. The kitchen has been supplied with every possible utensil that a family would need to cook their meals there. The Emerald Towers staff were very pleasant, friendly, and helpful, and the owner was very pleasant and easy to work with. I cannot imagine a better place to spend our vacation. The condo was very spacious and set up to allow for privacy when needed so it never felt crowded. It was very beautiful and the kitchen totally stocked for all your cooking needs. The balcony view was so relaxing. The office staff was very helpful and the owners as well. Many wonderful memories were created during our stay. Loved it!